An ocean is a water mass with islands. Marine entities handle rescues, oceanographic research, ... Oceania has 14 countries, or nations. shipping lanes. Air Lanes. ports. Cruise Ships. Davy Jones Locker. research and exploration. ? ? law of the high seas. courts? jails? coast guard, sea rescue, navies. mining, fishing, oil. Sports. Salvage. 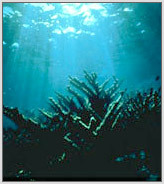 Coral Reefs. Fisheries. Contains islands.